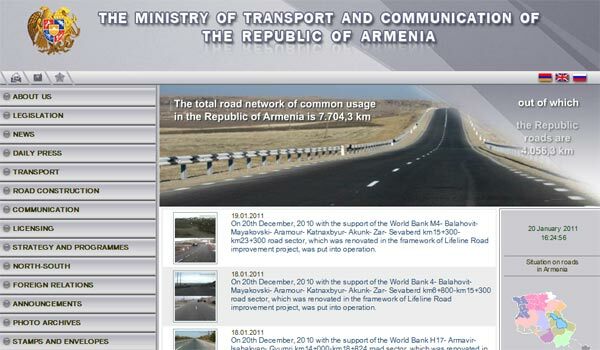 The website of the Ministry of Transport and Communication of Armenia was recognized as the most transparent among official websites of state bodies of Armenia during research held by the Committee on the Defense of Freedom of Speech. Twenty-three official websites and ten provincial websites were studied in September-October, 2010, a program, financed by the Open Public Institute. Five website, according to their importance, were estimated separately: the website of the Prosecutor’s Office, the Government, the Constitutional Court, the National Assembly, and the President of Armenia were considered to be transparent in descending order. Taking into consideration the Constitution of Armenia and the RA Law ‘On Freedom of Information’, issued since 2003, 177 standards were drafted, the main ones among them were the completeness of a website, its urgency and accessibility. According to these standards, the Ministry of Labor and Social Affairs of Armenia and the Ministry of Education and Science are correspondingly in the second and third places. “The website of the State Revenue Committee, which reports obscure information, is in the lowest position. It is not quite clear what a body it is, and what kind of an activity it carries out,” says Mesrop Harutyunyan, one of the experts of the program. According to the research, the absence of the Ministry of Emergency Situations’ website is also a shortcoming. And the websites of Lori and Ararat provinces (among the ten provincial websites, which were studied), cannot be visited at all, while the rest of the (provincial) websites have very little information. “Not a single official website mentions where a citizen can appeal the decisions of this or that structure,” Harutyunyan says. Ashot Melikyan, head of the Committee on the Defense of Freedom of Speech, hopes that the research will somehow sober state structures and will promote information accessibility.